Thirty Mile Point is so named because it is thirty miles east of the mouth of the Niagara River, which empties into Lake Ontario. The lighthouse was constructed in 1875 to mark a sandbar and shoal located offshore. Several vessels have been lost near the point. A French vessel under explorer Sieur de La Salle was lost here in 1678. The H.M.S. Ontario, carrying British troops and an army payroll of $15,000, sank here in 1780. The Mary went down in 1817. The lighthouse is constructed of limestone, and is seventy feet high. The third-order Fresnel lens, which cost $3533.85, could be seen for sixteen miles. The lantern was lit by kerosene until 1885, when it became one of the first lighthouses illuminated by electricity. The residence was originally designed to house a single family, but was later expanded to house two. The addition, built of tan brick, is clearly visible today. The Coast Guard assumed control of the station in 1935, and added a fog signal. By 1958, the shoal and sandbar had eroded away, and the lighthouse was taken out of service. A skeleton tower was built nearby to replace the light. In 1984, the Coast Guard turned over the site to the New York State Office of Parks, Recreation and Historic Preservation. Today, the lighthouse is the centerpiece of Golden Hill State Park. The lighthouse has been painstakingly refurbished and restored by the staff of the park. The park consists of 50 campsites, numerous trails, a playground, picnic areas, a marina, and a boat launch. The horse barn is now a garage, and the fog signal building is now a recreation hall for campers. 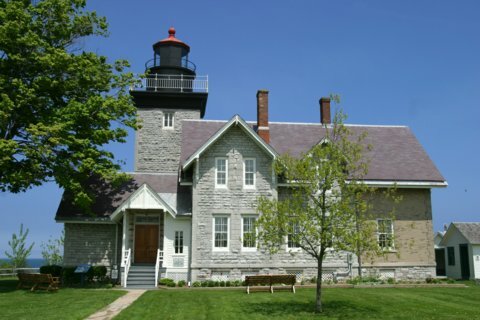 In 1995, the Postal Service selected Thirty Mile Point as one of five chosen for its "Lighthouses of the Great Lakes" series. The stamps were issued in June, 1995. The stamp was designed by Howard Koslow. In 1998, a low power plastic lens was installed in the lantern room. Today the light serves as a private landmark lighthouse to mariners. Open year round. Camping season begins in mid-April and ends in mid-October. Hunting for small game and waterfowl are permitted during season. I'll cost you $6/car to enter the park. From Fort Niagara State Park in Youngstown (you'll be visiting Old Fort Niagara Light first, right? :-), take Route 18 east for about 26 miles. A few miles beyond Somerset, you'll take a left onto Carmen Rd. In 1.3 miles turn right onto Lower Lake Rd. In just under 0.5 miles you'll come to the first entrance for Golden Hill State Park (the entrance for campgrounds). Take this entrance. Once you enter the park head towards the right side of the park. You'll see the lighthouse soon after entering.